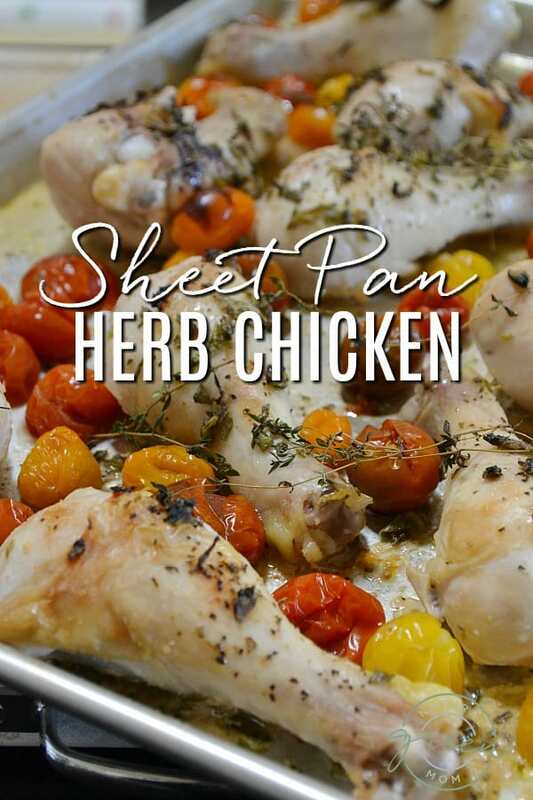 Herb chicken is roasted on a sheet pan for an easy family dinner everyone loves. This recipe is such a hit with my family, I have made it weekly for the last 4 weeks. Every time I make it, I plan to have some leftover for a future lunch. Every time I make it, I am sadly disappointed because we never have any leftover. I make this easy sheet pan supper with drumsticks because they are inexpensive and kids love them. Moreover, drumsticks roast beautifully on a sheet pan. If your family prefers chicken thighs, you could substitute them in this recipe. Or, you can do a mix of thighs and drumsticks. Just know that if you chose to use thighs, you will pay more (as I note in my Costco Shopping Haul Video). Have a family that doesn’t enjoy dark meat? Try making this with boneless, skinless chicken breasts. Since chicken breasts are leaner, to keep your chicken moist, opt for a bit more olive oil and lemon juice than the recipe recommends. While it is acceptable to use dried herbs in this recipe, I’d like to highly encourage you to go with fresh. It looks pretty with fresh herbs, doesn’t it? Fresh herbs can be expensive, which is why I recommend growing your own herbs. During the summer, all of the herbs used in this recipe are easily grown in pots. Or, grow these herbs year-round on a sunny windowsill. 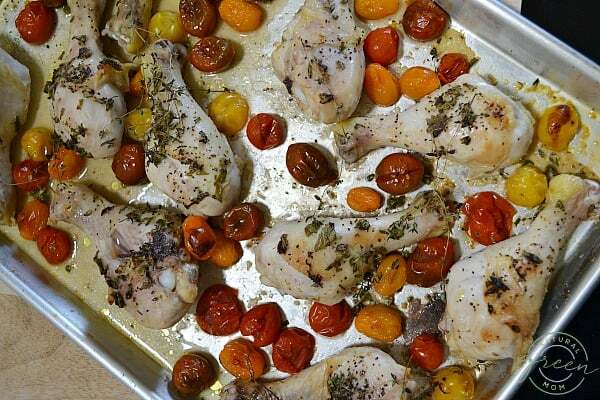 When adding the cherry tomatoes to the sheet pan, there is no need to cut them first. Simply add them to the sheet pan and let them burst while roasting. Now, if you are new to sheet pan cooking, make sure you have the right pan. Sheet pans are sturdier than lined, rimmed baking sheets. Opt for a steel pan – not aluminum. A good steel baking sheet will run you around $15 and it will last you forever. Preheat oven to 425. Grease a sheet pan. In a large bowl, whisk together lemon juice, garlic, sage, rosemary, thyme, olive oil, mustard, and salt and pepper. Add drumsticks to bowl and toss to coat. 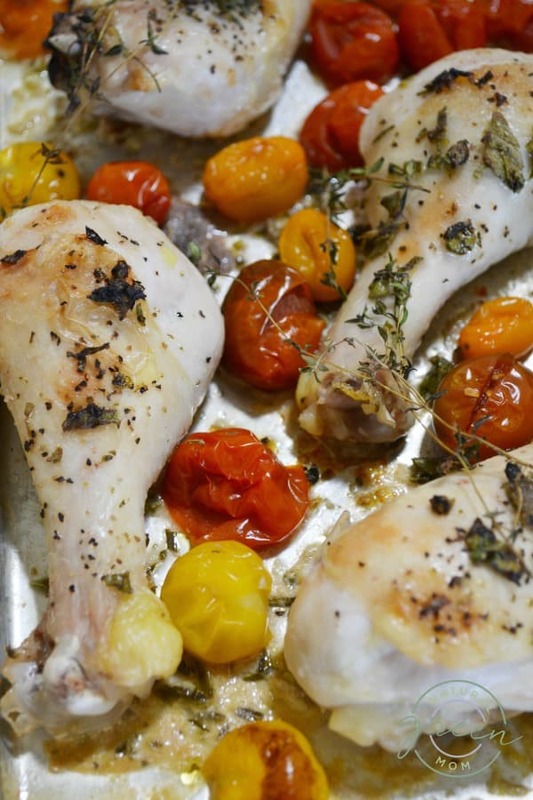 Place drumsticks on baking sheet. Surround with tomatoes. Drizzle any remaining lemon juice mixture over chicken pieces. Roast drumsticks for 20 minutes. Turn pieces over and roast an additional 20 minutes. 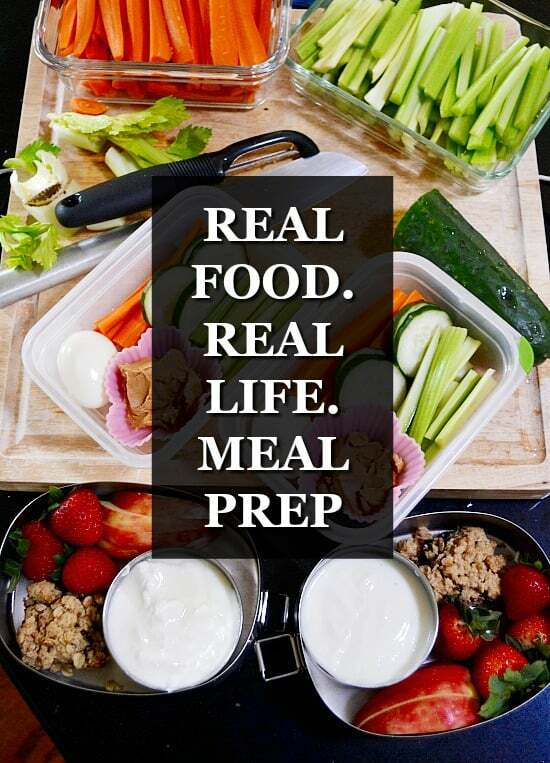 This recipe is perfect for Whole30, Paleo, 21 Day Sugar Detox, and Trim Healthy Mama. While Trim Healthy Mama is “picky” about tomatoes, it has been noted many times on their Facebook page that a small amount of tomatoes is acceptable in an S setting. Need more recipes like this one? Check out my Pinterest Sugar Detox board.